They may be able to gather signals intelligence, act as a flying command posts, or even launch electronic attacks. The first prototype Beriev A-100, set to be Russia’s newest airborne early warning and control aircraft, has made its first flight, with the Russian Air Force hoping to get the first examples by 2020. In addition to its prominent radar dome on top, antennas cover significant portions of the plane, suggesting that United Aircraft Corporation, or UAC, is moving ahead with reported plans to make the design a multi-purpose command and control, electronic warfare, and intelligence gathering platform. On Nov. 18, 2017, the initial A-100 prototype made its maiden flight from the Taganrog Aviation Scientific and Technical Complex (TANTK), situated near the Sea of Azov that sits between Russia and Ukraine. 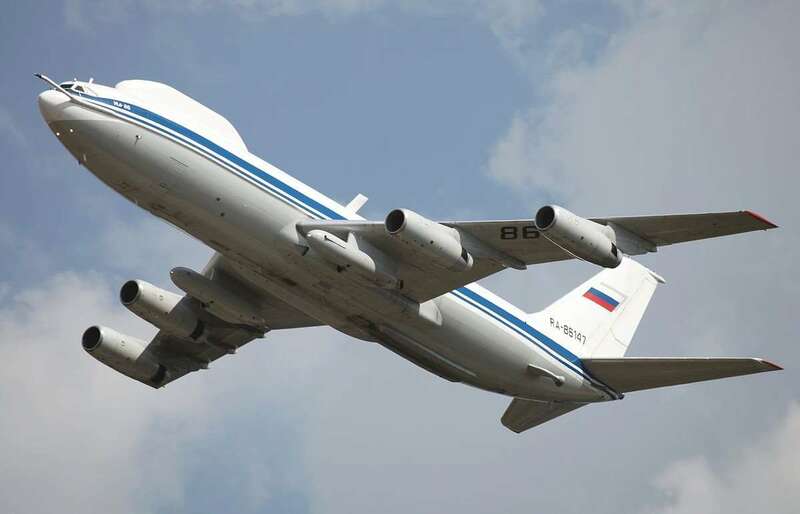 UAC used an existing Il-76MD-90A transport aircraft to create this “flying laboratory,” referred to specifically as the A-100LL, which will serve as test bed make sure the various antennas and fairings are aerodynamically sound and that the various radars and other systems work as intended. 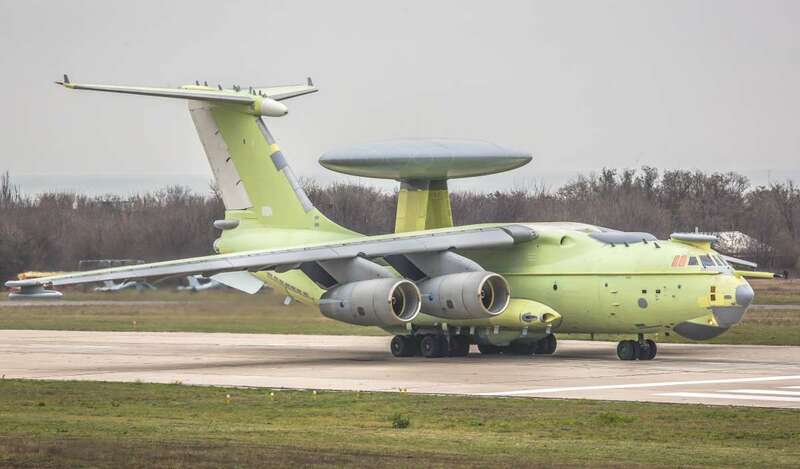 The production versions will reportedly use new build Il-76MD-90A airframes, also known as the Il-476, and will replace Russian Air Force’s existing A-50M and A-50U Mainstay radar planes. In an official press release, UAC said the A-100s would be able to detect both air and surface targets at long range and help direct fighter jets and strike aircraft to their targets in the air, on land, and at sea. In the past, Russian officials have said that the new design will be able to spot and track nearly any enemy, including low-flying cruise missiles and stealth aircraft. We have no way of confirming these claims, but the new A-100s will definitely be a significant improvement over the older A-50 types. The most widely reported upgrade is the replacement of the old, mechanically-scanned with a new Vega Premier faster scanning active phased array radar (APAR). Vega Premier manually scans in azimuth, but electronically in elevation and gives the A-100 the ability to detect and track multiple targets at longer ranges and with greater precision. Russian officials say the system can spot aerial targets more than 370 miles away and warships nearly 250 miles from the aircraft, according to Jane’s 360. Whether it has the ability to detect low-observable aircraft or not, the A-100 will still be another important component of Russia’s anti-access/area-denial arsenal as it offers an inherently flexible means of monitoring potentially contested air space, such as over the Baltic Sea or the Black Sea. The Russian Air Force’s existing A-50s have already gone to Syria to challenge the ability of aircraft belonging to the U.S.-backed coalition fighting ISIS to operate over that country with impunity. Linked together with fighter jets in the air and integrated air defenses on the ground, an A-100 might further improve their ability to defend against complex threats, including enemy stand-off attacks using low flying cruise missiles, such as the U.S. military’s Tomahawk Land Attack Cruise Missile strike against Syria’s Shayrat Air Base in April 2017. In 2015, the Russian Air Force said that four MiG-31 Foxhound interceptors had successfully knocked down a Kh-55 cruise missile during a test with the help of an A-50. In using the Il-76MD-90A as the starting point, the A-100s will be easier and cheaper to operate than the A-50s that used older Il-76 airframes, as well. The MD-90A variant has four PS-90 high-bypass turbofans, which make it more fuel efficient and give it more flying time, allowing it fly longer distances or loiter over a certain area of the battlefield for a longer amount of time. The latter capability is particularly important for an airborne earlier warning and control aircraft managing operations. It is possible that this updated aircraft will also offer better altitude performance, allowing for longer radar horizons. The A-100 will also have an aerial refueling capability, a feature already present on the A-50M and U models. On top of that, the new aircraft will have new avionics, mission systems, and work stations to help reduce the workload for the flight crew and systems operators. The standard Il-76MD-90A cargo plane already featured a “glass” cockpit with six large multi-function displays and other enhancements. 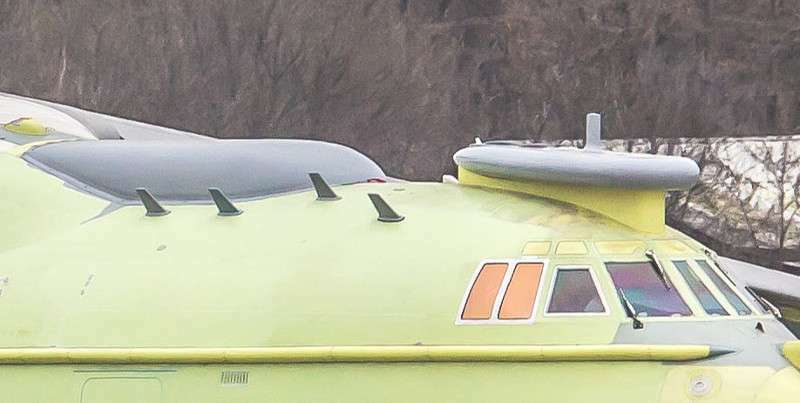 But a closer examination of the A-100LL prototype shows a number of other striking features that the Russian Ministry of Defense and UAC have declined to highlight, notably antenna farms on the top of the forward fuselage, on the wheel well sponsons, and across the tail, as well as what appear to be satellite communications domes, some of which seem extraneous to an airborne early warning and control mission. Signals intelligence and radio relay and data-link information fusion aircraft more commonly have this type of configuration and it could be that the A-100 will be able to perform a number of different roles. Even a tertiary electronic warfare mission isn’t implausible considering Russia’s focus on these tactics as of late. Below are a series of cropped images of the A-100LL prototype focusing on the various antenna arrays. A tactical airborne command center capable of rapidly passing large amounts of information back and forth between other aircraft and troops on the ground could increase Russia’s ability to deploy relatively quickly and support operations in places where it would otherwise have limited military communications infrastructure. And like the U.S. Air Force’s Battlefield Airborne Communications Node (BACN), an A-100 operating a central operational hub could just help speed up the flow of important information and extend the ranges at which various units could talk to each other and share vital data. This in turn would improve commanders’ overall understanding of the battlefield and how best to respond to what might be rapidly evolving situations. Having the A-100 able to take on this mission would be a boon to the Russian Air Force, which at present only has a handful of Il-80, Il-82, and Tu-214 command post aircraft. In addition, these are existing planes are dedicated strategic communications assets, not tactical battlefield management aircraft available for routine, conventional military operations. The Il-80s and Tu-214SRs in particular are highly specialized “Doomsday” planes able to ferry the Russian president and his closest advisers around during a nuclear attack and are analogous to the U.S. Air Force’s VC-25A Air Force One and E-4B Nightwatch National Airborne Operations Centers (NAOC). The Russian Air Force has a larger, but aging fleet of aerial electronic warfare and signals intelligence platforms, primarily consisting of a number of aging Soviet-era Il-20 and -22 Coots. 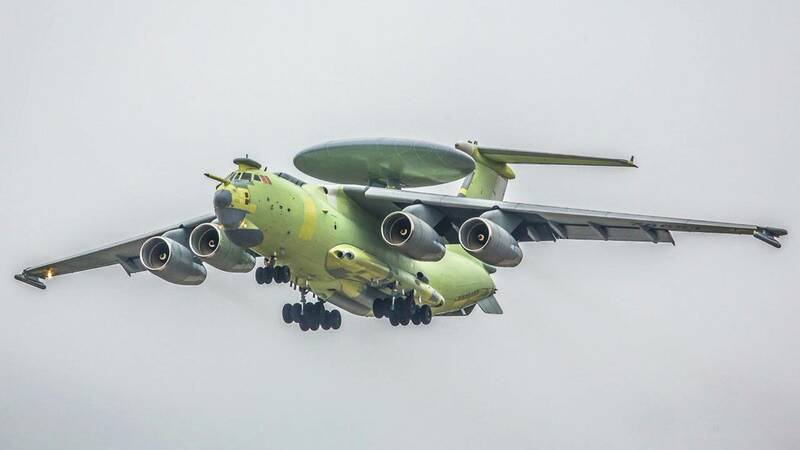 As with the A-50s, these aircraft have already been flying over Syria, helping forces loyal to Syrian dictator Bashar Al Assad and Russian forces support him locate and engage rebel groups. 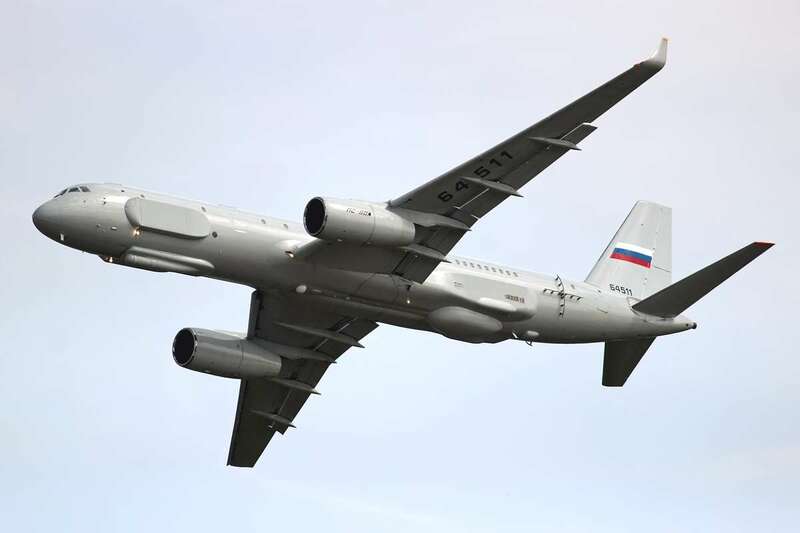 Another variant of the Tu-214 was supposed to replace those older aircraft, but so far the Kremlin has been able to acquire just two of these Tu-214R. These planes are multi-intelligence platforms that reportedly carry signal snooping gear, imaging radars, and multi-spectral cameras. Underscoring their importance to Russian operations, in February 2016, the Russian Air Force reportedly deployed one in an apparent field test and returned it to the country later in the year after it officially entered service. After the A-100LL’s first flight, Russian Ministry of Defense’s internal Red Star newspaper also reported that there were plans to use the platform to control unmanned aerial vehicles. Since the Russian military relies on line-of-sight control for its unmanned aircraft, this could dramatically extend the range and scope of its drone operations. Russian troops have already made significant use of unmanned surveillance drones in Syria and Ukraine to spot targets, adjust artillery fire, and assess the aftermath of air, sea, and land-based artillery and missile strikes. With this capability, the A-100s could free these pilotless planes from the tether of control stations on the ground extend their reach further deeper into enemy controlled areas. It could also give commanders on the ground and in the air the option of adding drones into additional types of missions or open the door for more complex unmanned operations in the future. Again, adding even a limited electronic warfare or signals intelligence capability to the A-100 could add additional flexibility during limited deployments. With the ability to track, monitor, or even possibly jam enemy radars or communications nodes, just one of the planes could be a huge force multiplier. Another possibility is that the aircraft could use sharply focused beams of electromagnetic radiation from either the Vega Premier or a separate active electronically scanned array (AESA) radar system to disorient or even disable targeting radars, protecting the aircraft or a larger force package en route to a target area. The Russian military’s steadily increasing focus on electronic and cyber attacks and information warfare means that it is possible, if not probable, that the new aircraft could carry specialized equipment to block or spoof satellite navigation signals, launch cyber attacks, or pump out propaganda messages. As we at The War Zone have noted many times in the past, taken together, these capabilities could easily allow Russian forces to disrupt enemy military operations, sow confusion, or sap troops’ morale. When it comes to attacks on the GPS network specifically, this could impact not only a U.S. military force’s ability to navigate, but also their ability to feel confident in employing certain precision guided munitions. And though we don’t know this will be the case for sure, as already noted earlier, turning the A-100 into a multi-role platform with diverse capabilities would be well in line with Russia’s interest in new systems to readily deny opponents access to certain areas. It is also possible that the A-100LL could end up being a test bed for modular electronic warfare or signals intelligence packages that will fit on other Il-76 cargo aircraft. The Russian Air Force has more than 100 Il-76s in service and has already experimented with turning some of those aircraft into bombers. How effective a cargo plane carrying a few unguided bombs would actually be is debatable at best, but having the ability to quickly turn them into electronic attackers or intelligence platforms, in to a limited degree, could be significantly more useful. The U.S. Air Force has already demonstrated how valuable such modular kits can be on the C-130 airlifter. For the Russian military, it would offer a distinctly low-cost way to add additional specialized aircraft in the face of shrinking defense budgets and competing priorities. As we at The War Zone have noted many times before, the Kremlin has repeatedly struggled to field a number of advanced military systems as a result of the country’s flagging economy and international sanctions in response to its active support of armed separatists in Ukraine. By combining a number of functions into the A-100 or using it to test more limited modifications for other aircraft, the Russian military might able to squeeze more value from the program overall. With all this in mind, and from the modifications already visible on the prototype conversion, it seems likely that the Vega Premier on top of the A-100 will only be one small part of the final design’s overall capabilities.